Launched in May 2011 in Vittoriosa, Malta Artisan Fairs have taken place six times in beautiful historic settings in Malta including Senglea and Kalkara. The next fair takes place 6-7 April in Malta’s capital Valletta. The fairs are the place to be if you’re a budding artist or if you would like to showcase a lifetime hobby. Lisa Grech, the name behind the fairs, talks about how her passion for the arts and markets spawned an initiative that’s been a springboard for many a local artisan and artist. How did the idea of the Malta Artisan Fairs come about? Several years ago I saw that there was a gap in the Maltese market for an authentic market where locals and tourists could find artisan products including arts, crafts and foods in an interesting historic setting. I felt that this would be good not only from a local perspective but also for tourists who may wish to experience local culture and gastronomy. I started to research markets overseas and then created a market concept specific to Malta. I knew I had to showcase some of the best fare in some of our best locations! The idea is to create a social hub where you can meet up in a family-friendly context and where you can make a day of it – browsing and purchasing beautiful local arts and crafts while tasting local artisan foods at the market. It’s also a great place where kids can get some first-hand experience on the art of making. Why is it important to have such a place for budding and established Maltese artists/makers? Markets provide an excellent platform for budding artists and artisan-entrepreneurs to test the market and sell their products with very few overheads while allowing them to research their product and glean immediate, face-to-face feedback from market-goers. 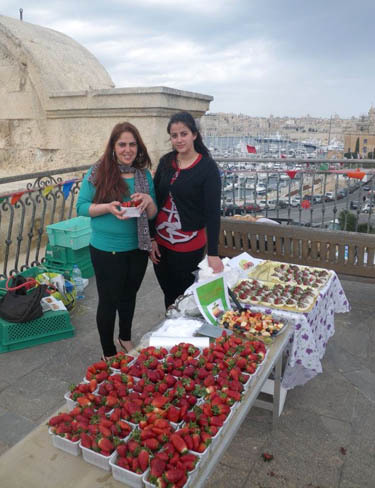 How has the Malta Artisan Fairs initiative grown? It has grown considerably since we started two years ago. We now feature around 60 stalls each market and the demand from stallholders and public interest keeps growing. The feedback from stallholders is extremely enthusiastic and shoppers are keen to attend our markets knowing they will enjoy a good day out and get some different gifts and items from those on the high street. How do you see the Fairs developing? Presently, local legislation does not allow people to set up markets in Malta on a regular basis and the Ministry is aware that this legislation needs amendments and hopefully this will be addressed very soon. In the meantime, we are a market on tour of Malta’s beautiful locations. Ultimately, I would like to see a regular market in one or two venues that you know that you can just turn up at any weekend and buy local products while meeting up with friends and family. The next Malta Artisan Fair will be held at the Phoenicia Ballroom, Phoenicia Hotel in Floriana (outskirts of Valletta, nr. bus rotunda) on the 6th and 7th April, 2013. There will be other fairs this year held in June, July, September, November and December in various locations. If you are an upcoming artist, are looking for an ‘outlet’ for your expression or know of others who would like a place to showcase their talent, we would like to hear from you. You can email us on: manager@maltaartisanmarkets.com. For more information refer to maltaartisanmarkets.com or keep posted through Facebook. Next Post Digital Nomads: can Malta attract them? Hi Mr. Attard. I’ve enquired about this incident which was a one-off, a few years back. The situation was dealt with. In as far as we are being vigilant, this does not happen. We welcome hand-made local artisan crafts and food. Thanks for your comments on the Artisan Fairs. The article was a Q&A with the organiser so I’ll ensure your comments are passed on. To be honest, I’ve not visited one recently, only the other artisan market called ‘Patches’ which seemed to have bona fide goods, locally made, and I have a feeling many of the Patches stallholders do pitch up for the Artisan Fairs too. So, I assume the percentage that offer what seem to be overseas or eBay goods, is probably rather small. I’ve noted your points and will pass them on as it’s important the organiser vets, as you say, stallholders’ offers to ensure they fit the criteria. Thanks for commenting. I must congratulate you on trying to promote local artisan but I am very disappointed with some of the participants .on going round one could very well see that there are a lot of things sold there which are not locally hand made but imported even from eBay.